I hadn't been going to watch it, because it had mecha. I don't hate mecha. They're just not my thing. However the show was a pretty big deal and at last I've got around to watching it. It's very good. It's created by fan favourite Gen Urobuchi (Puella Magi Madoka Magica, Psycho-Pass), which personally gave me slight reservations, but fortunately this particular story is a good fit with his strengths and weaknesses. It's a war story. The Earth's getting stomped by Mars. This works well with Urobuchi's tendencies to cold, potentially off-putting characterisation and the prioritising of plot over character-driven storytelling. War's like that. It's okay not to spend too much time emoting when you've got higher priorities, e.g. a Martian war machine tearing apart an entire city and shrugging off all attacks with alien invulnerability as it specifically chases you. More positively, it also showcases Urobuchi's strengths. He's intelligent. He'll quote von Clausewitz and have characters correct each other on points of real-world physics. An Urobuchi show will be thoughtful. He's genuinely interesting with his political material, dissecting the origins of nationalist bigotry and the reasons for everyone behaving like shits. I really like how the show picks apart some of the antagonists. Also, crucially, clever characters really are clever. Inaho's tactics against Martian war machines are deeply satisfying because his logic is so clear and makes so much sense. It also helps to know the Urobutcher's reputation, although you'll soon work it out for yourself. No one's safe in an Urobuchi story. There's no such thing as plot immunity, so there's a greater sense of danger. It's not unlike War of the Worlds. (The earlier war machines from 1999 are even tripods!) What's different is that these Martians are human colonists who've since decided that they're a superior race with the right, nay, the responsibility to retake Earth from their inferior cousins who are currently infesting it. They're utter bastards, obviously. The story's set in the present day, i.e. 2014, but in a world where the 1969 moon landings discovered an ancient alien hypergate. This let us colonise Mars. Those colonists discovered yet more alien technology and established what they called the Vers Empire, which eventually declared war on Earth. This ended in catastrophe when the moon shattered, trapping the remnants of the Vers Imperial Army in the resulting debris. They've been up there ever since, nursing their poisonous sense of racial superiority. The cast are nifty, albeit potentially polarising. Inaho's almost emotionless, which Urobuchi is playing harder and colder than you usually get in anime. He'll tell you to your face that you're expendable and he does something halfway through that really, really isn't good or nice. However he's also extremely clever and absolutely determined to fight for Earth's survival. Slaine is... well. Don't expect warm fuzzies from his character journey. Then there's the beautiful, kind Martian Princess who loves all people everywhere and is visiting Earth in ep.1 on a mission of peace and harmony. Um. Plus others. These people aren't all lovable, to put it mildly, but I found the planetary invasion plot easily huge and terrifying enough to carry the show and give the cast enough room to be cool. The plot has a couple of disorientating jumps. Something jarring will have happened and we didn't see the story take us there. This is deliberate rather than just bad writing, though. Occasionally it's even funny! "Shall I explain why you're unpopular?" It's technically a giant robot show, of course, but saying that is almost a category error. It's a war movie. The weapons happen to include giant piloted robots, yes, but Earth doesn't have any. The usual audience reaction to a robot thus isn't "cool, a giant robot battle!!!" but "we're about to see a one-sided massacre that will probably include the indiscriminate slaughter of civilians". You'll notice Urobuchi slyly tipping his hat to genre convention with a GATTAI in ep.12, though. ...hang on, wait a minute. What the hell did I write there? Of course both sides have giant robots! It's just that the difference in size and tech level is so huge that it's as if they don't. It's like Ewoks vs. AT-ST Walkers. The show's addressing questions of identity, with Martians waging war on Earthlings on the grounds (among others) of racial inferiority even though they're all indistinguishable from each other. It skewers and bloodily subverts all kinds of fist-pumping cliches, from "all Martians are evil!" jingoism to "bullets only hit cowards" machismo. Similarly its SF and technology are all solidly thought out, as are its worlds' social and political history. Personally I'd call this my favourite Urobuchi anime to date, although admittedly Puella Magi Madoka Magica and Psycho-Pass both made a bigger splash. I find its themes more relevant and its doom-and-gloom nihilism actually fits rather well. 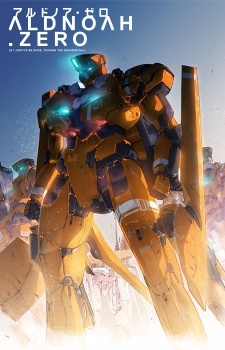 It's intelligent and politically aware... but it's also got loathsome bastards trashing the world in giant robots. "I wished that everyone all over the world would get on and live in peace."